Fall student, Ashley Powell, practices her rescue diver skills on an “unconscious” Sarah Miller. Students practice skills for their advanced certifications. 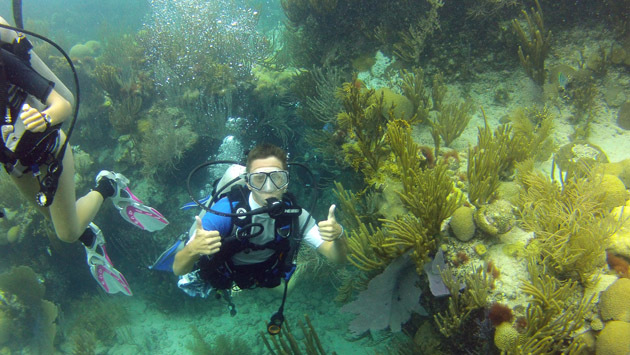 Teegan Innis gives two thumbs up after his first dive ever on Bermuda’s reefs. 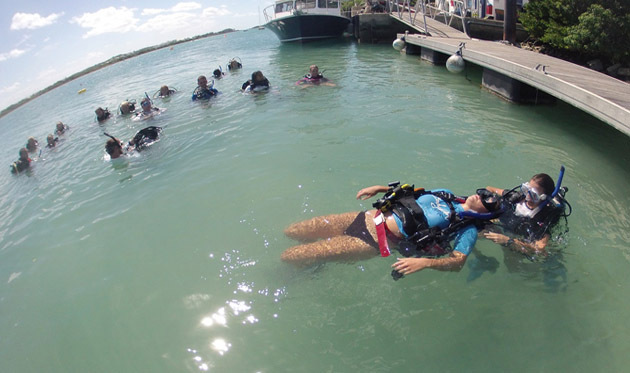 The process of learning how to SCUBA dive can teach students many skills and concepts that reinforce classroom physics and biology lessons. 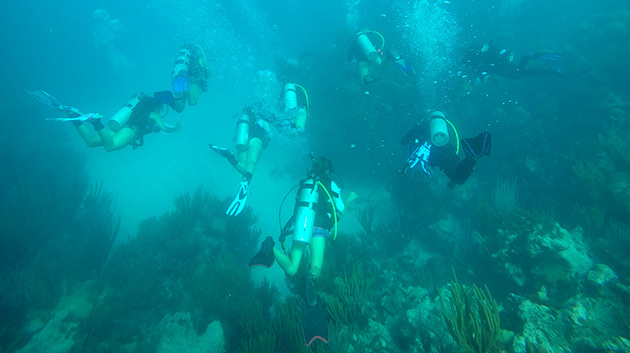 For students interested in pursuing careers in ocean science, SCUBA certification can provide them with a better understanding of underwater habitats and fieldwork techniques and allow them to collect simple data for projects and reports. (Not to mention that SCUBA certification is a valuable asset and qualification to list on a resume for internships and employment!) For younger students, the mature, safety-conscious attitude instilled through SCUBA training teaches them responsibility and teamwork. Educational diving refers to initial training and continuing education in SCUBA through PADI or another universally recognized diving authority. 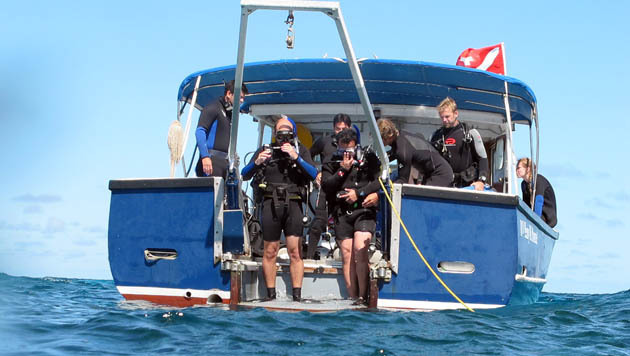 It requires the direct supervision of a Dive Master or Dive Instructor as required by PADI (or equivalent agency) and provides the minimum required student to instructor ratios. 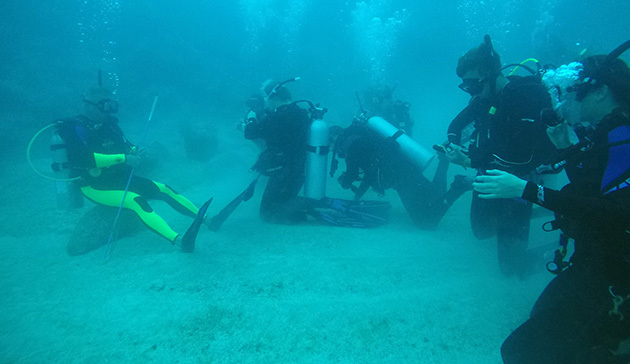 Educational diving at BIOS may involve basic data collection when part of a designated course (e.g., Project Aware Fish ID specialty); however, the emphasis of educational diving is on training rather than data collection. Students participating in the Educational Diving program at BIOS will be encouraged to work toward a higher certification level. Please refer to the Visiting Groups Fee Schedule and Information for costs associated with staff lectures (for dive theory training), Dive Master supervision (hourly or half day rate for confined and open water training) and tank rental for Divemaster and students.